Do you feel a sharp or nagging pain in your hip that makes walking, sitting or even lying down a chore? Do you have a painful, unstable knee that feels as if it may buckle at any moment? Either of these sensations can seriously interfere with your lifestyle — and if you’re experiencing both at the same time, you may find even simple tasks impossible. That’s when it’s time to turn to physical therapy. Our Silver Springs physical therapists can help you manage your hip and/or knee pain issues safely and without drugs or surgery, so contact Sports & Orthopaedic Therapy Services in Silver Spring, MD today for a consult! Physical therapy can often relieve (or greatly reduce) hip and knee pain, sparing you the need for medication or surgical correction. In addition to examining the hip and/or knee itself for signs of structural damage or misalignment, our Silver Springs physical therapists will also study your posture, stance, gait, and pain-free range of motion. We can then prescribe the right forms of physical therapy to help normalize joint function and relieve unnatural stresses and strains. Ready to make friends with your hips and knees again? 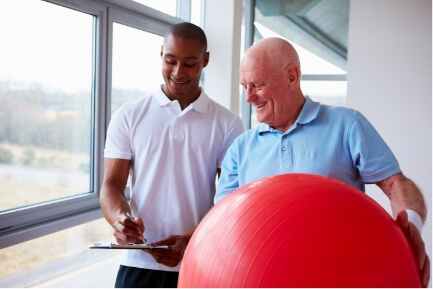 Contact one of our Silver Springs physical therapists to schedule an evaluation!